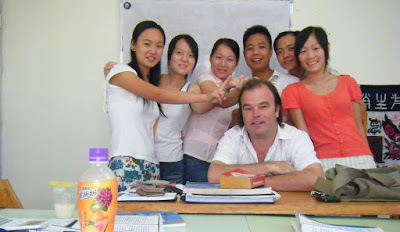 I met Jim in Zhuhai, China, where we went through a month long TEFL course together. Following the course I went down to Thailand and met up with him again in his previously established realm of influence, which he generously shared. He then returned to China for work and I returned some time for play. 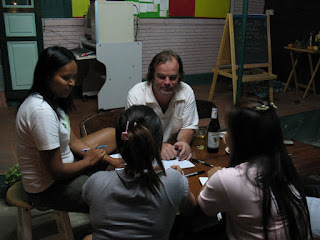 I think he's still sifting through the teaching opportunities, but here you see him at his 9 pm English hour at the now defunct Sansook Place in Thailand and have a good time wading through the sewage-y floodwaters of Yangshuo, China. Perhaps those were the days. 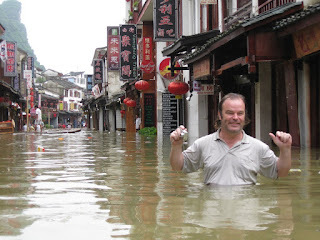 Were standing in the water while photographing him? Maybe the question is too obvious, but I'm amazed. oh, yes, definitely. i'm the one who convinced him to enter the water in the first place.